"Four... no, five bogeys coming in at three-five. I've got radar locks - rake an' bake 'em!" "Negative, negative; we still have to online the 'racks! Get us some breathing room!" "There ain't no breathing room in a vacuum! 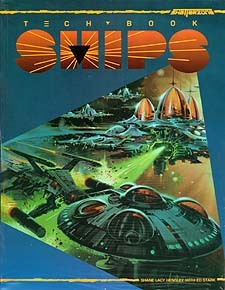 We've got to -"
Tech Book: Ships contains an expanded combat system for use with the basic Shatterzone rules. It also provides a complete section on spaceship and starship construction. Take a trip to the 'zone under your own power... or float home frozen.